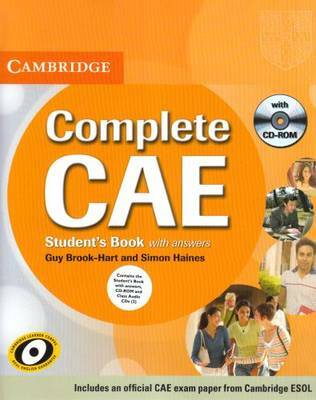 Complete CAE is a new course for the 2008 updated CAE exam. Informed by the Cambridge Learner Corpus and providing a complete CAE exam paper specially prepared for publication by Cambridge ESOL, it is the most authentic exam preparation course available. Complete CAE combines the very best in contemporary classroom practice with first-hand knowledge of the challenges students face. There are exercises to help students avoid repeating the typical mistakes that real CAE candidates make, as revealed by the Cambridge Learner Corpus. This topic-based course covers every part of the CAE exam in detail, ensuring that students are fully equipped to tackle each part of every paper. In addition, the accompanying free CD-ROM enables students to focus on their own particular areas of difficulty and work at their own pace. Everything you need for your CAE exam. Very complete, with exercises and exam tips.